One of the most efficient and effective racking systems available! "One of the most efficient and effective racking systems available"
Apex push back racking is one of the most efficient storage racking systems available and is suitable in warehouses who are able to dedicate lanes to specific products. 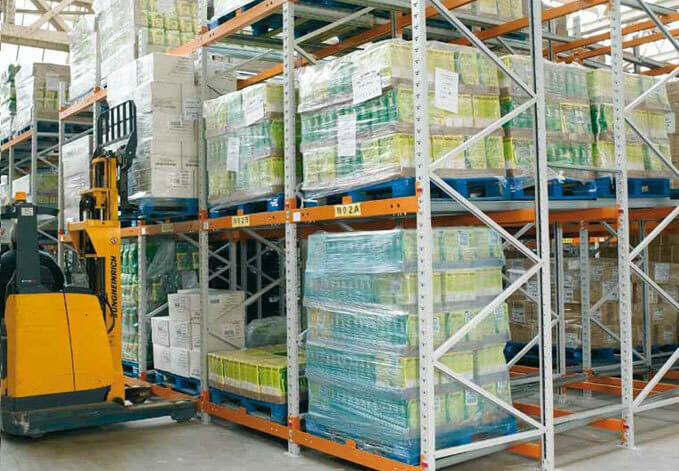 This racking adopts the FILO principle and is accessible using most standard forklift trucks. Accessibility is impressive with this Apex pallet racking system and all lanes can be accessed whenever necessary, regardless of the storage level. Ideal for slow or fast moving operations, this system is extremely economical in terms of maintenance and repair. Apex push back is perfectly suited to load marshalling and allows the storage of up to six pallets in a single lane. Warehouses that handle bulk items and bulk storage will benefit from the installation of an Apex Push Back pallet racking system. Store up to 4 pallets deep on our pusch back racking. When the first pallet is retrieved the next will roll forward into position. This demonstrates how push back racking benefits from the first in last out principle. Each product can be given its own dedicated lane making Apex push back pallet racking ideal for bulk storage. If you choose to buy your Apex pallet racking from BSE UK you will receive a high quality storage product from an experienced and professional company. All of our Apex racking systems come with the guaranteed quality of certification to BS EN ISO 9001. Not looking for Apex? We also provide push back racking from manufacturers including Dexion and Link 51. Speak to the experts in push back racking systems from BSE UK.